Woods Eastland had an unusual childhood for a boy born in the Delta. For three months each year he worked on the farm that had been in the family since the 1880s. The other eight or so months he lived in Washington D.C., where his father, James Eastland, was a senator for thirty-six years. Washington was a far different place in those days. Eastland recalls seeing Bobby Kennedy driving around town in a convertible with the top down. Eastland can recall when the route from Union Station to The White House was all three-story houses, including low-income housing. Now the area has been largely taken over with lobbying organizations. He recalls his father as a master politician, and attributes his father’s political strength to doing everything he could to help the little man. After high school Eastland went to Vanderbilt University in Nashville and then on to law school at the University of Mississippi. After graduating from law school, he served two years in the Judge Advocate General’s Corps of the Navy before going to work as a lawyer in Jackson where he also taught real property law at the Jackson School of the Law. Staplcotn based in Greenwood, is the oldest cotton marketing cooperative in the U.S. and currently has more than 13,000 farm accounts in an eleven-state area in the Mid-South and Southeast and a warehousing operation with fourteen locations in four states. Eastland liked the job so much that he ended up working as president and CEO for 24.5 years, retiring in September of 2010. During those years he also became a director of the New York Cotton Exchange, which later merged with the coffee, sugar and cocoa future’s exchange and became the New York Board of Trade. For a brief period of time he was vice chairman of that board of directors. He resigned from the New York Board of Trade in 2005 because he was going to be president of National Cotton Council that year. Meredith Allen, president and CEO of Staplcotn, said that Eastland set high standards for leadership at Staplcotn which they all continue to be inspired by to this day. “His influence on Staplcotn will continue to be a positive force for decades to come,” Allen said. 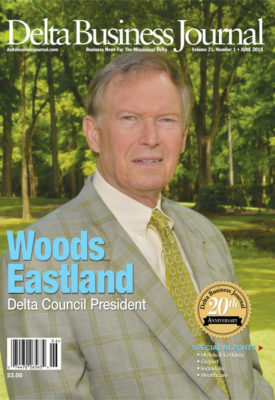 After retirement, Eastland has continued to be busy with his goals to make the Delta a better place. He continued to serve at Staplcotn as chairman of the board until 2013. He is on the board of directors of the B.B. King Museum in Indianola and on the board of directors for the Indianola Promise Community whose goal is to improve academic performance in school, which is a predictor of quality of life for everybody in the community. He is also on the board of the Delta Health Alliance, the parent company of the Indianola Promise Community, which works to improve education achievement and the health of the community. His friend David Fisher admires what Eastland does not just on non-profit boards, but for individuals. Eastland is looking forward to his role as incoming president of Delta Council during a transitional year with long time executive vice president Chip Morgan retiring. This year Congress will be working on a new farm bill. So, Delta Council will, as usual, be working to provide a lot of input. There were some concerns about how cotton fared under the current farm bill, but Eastland said the framework that was changed this year in regards to cotton is workable. “Delta Council’s work on the farm bill has always been to try to maintain some kind safety net for farmers with tremendously bad weather or prices,” he said. “And, in recent years, Delta Council has put increasing focus on the conservation and the environmental sides of agriculture. Another long-term challenge is depopulation of the Delta. Since retiring, Eastland has taken time to get to know his hometown of Indianola. Before retiring from Staplcotn, about the only time he was there was to sleep. Eastland, who is a duck hunter and Ole Miss sports fan, has been married to Lynn Wood from Hollandale since 1974 and they have two children, Lane Eastland McCluer and Brad Eastland. They also have three grandchildren. Eastland and his wife are members of St Stephen’s Episcopal Church in Indianola, where he is a licensed Layreader. “That land has been in our family since the 1880s, so it becomes part of your psyche,” Eastland said.